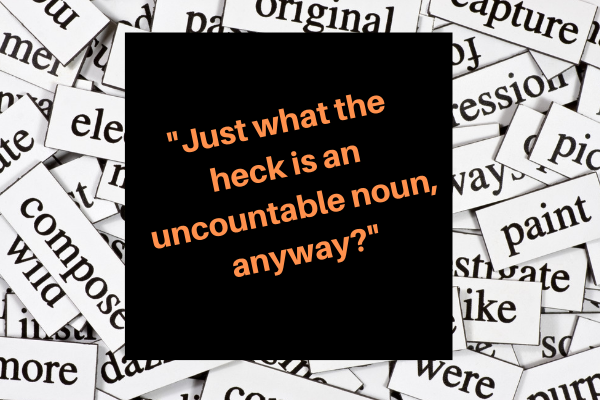 Just What the Heck is an Uncountable Noun Anyway? Woohoo! As a word-loving grammaratarian, I sure do like to hear about new grammar concepts. Here’s one for you. Uncountable nouns or mass nouns. These non-count nouns are different from count nouns, as you can clearly tell. To be an uncountable noun is a noun that cannot be modified with a number on its own. Sound exciting? What if I told you this includes words like a list, a great deal, and a hair’s breadth? Let’s explore a few more of these uncountable nouns and find out how you can stick these in your content this week. OK, ok, this is a trickster. See, while you may be able to count items on a list, when it comes to counting the actual lists, well, those are uncountable. You could say I have ten lists, but lists of what? You need to have a qualifier in there for the unit of measurement that you are counting the lists as. Think about it like this. Would you ever write, “She has 25 lists of lists of….” and it make sense? Nope. Here’s a fun one for our Aussie writers who are likely the only writers well aware of this uncountable noun. A few roos loose in the top paddock is actually an idiom. Those in the Southern Hemisphere use this idiot, oops, I mean idiom, to call out those who are crazy, act foolish, or behave in a nonsensical manner. Aka they have a few roos loose in the top paddock. You may technically be able to count your eggs before they’ve hatched and chickens before they’ve been cooked. But if you have a chicken in every pot, there’s the open-ended question of exactly how many pots you’ve got to cook those chickens. One pot? One dozen pots? A hundred big boilers full of hot water ready for poultry poaching? Well, now, as far as this writer can tell, a bridge too far is just as useful as a seashore shanty in Sioux Falls, South Dakota. A bridge too far…this one is just a huckster. Two bridges too far sound a bit too much. Turkey jerky, deer jerky, and even soy jerky for my fellow vegans out there…all uncountable nouns. When you say beef jerky, you aren’t going to say five beef jerky and get away without a sneer or snicker from the person selling said jerky. Jerkies…is that even a word that does not refer to people who are jerk…ies? Want more funky and fresh grammar morsels? Bookmark this blog and visit regularly to hear more from the Whispering Wordsmith of the Woods.